Hamlet sired his first kittens,5 lovely babies, December 19-2014 mated to Shadow. 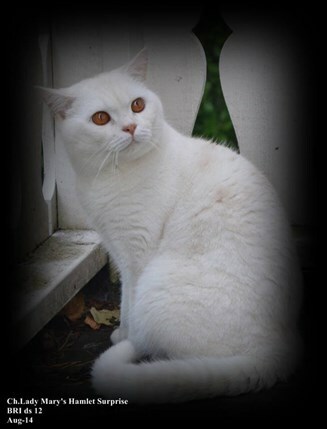 Hamlet was indeed a big surprise, Lady Mary's first red shaded or shaded cameo as his colour is named., out of his tortie silver tabby mother Kathy de Lalique and silver spotted father Sc.Lady Mary's Silver Wellin Spirit. Both silver parents but when the red genes from his mother plays a wildcard, the result can be a very unique boy with a very unique color. Sometimes a cat you cannot live without comes along. That's my Hamlet. A very irresistible young man with outstanding personality and temper. Hamlet has made excellent results at the show bench. 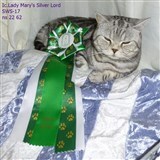 Nominated for Best in Show several times in kitten and adult class. 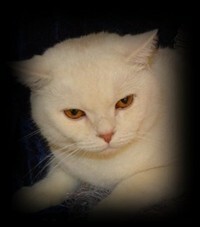 Specially he has a fantastic coat texture, outstanding eyecolour and has got a very nice development. Just to mention some of his amazing features. I found him particularly interesting for the tortie silver tabby/spotted colours and wanted to give his qualities a chance for breeding in these varieties. From Hamlet's first litter mated to his silver tabby Dam Shadow, it resulted in some very exciting breeding results, 1 tortie silver spotted girl, 2 tortie silver tabby girl, 1 silver tabby male and 1 spotted girl. Well developed at 3 years of age he was neutered and both him and daughter Lilijana and son Lord are to be seen at the show bench making excellent results.